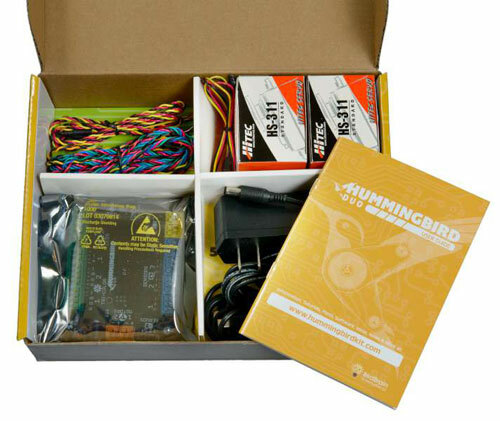 The Hummingbird Robotics Kit is a spin-off product of Carnegie Mellon’s CREATE Lab. Hummingbird is designed to enable engineering and robotics activities for ages 13 and up (age 8+ with adult supervision) that involves the making of robots, kinetic sculptures, and animatronics built out of a combination of kit parts and crafting materials. 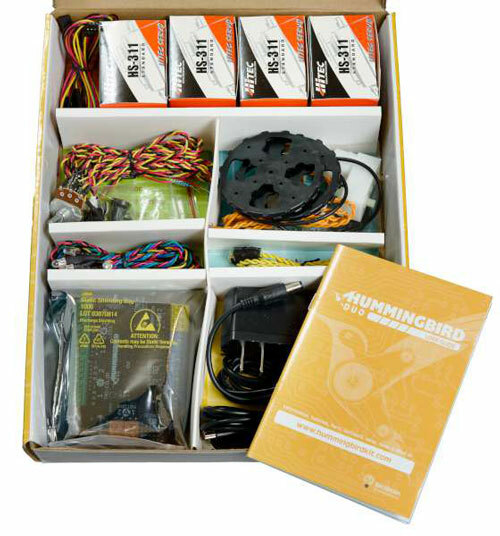 Combined with very easy-to-use software environments like Scratch, Snap!, the CREATE Lab Visual Programmer and Ardublock, Hummingbird provides a great way to introduce kids to robotics and engineering with construction materials that they are already familiar with. At the same time, Hummingbird continues to provide new challenges by allowing programming in the Arduino environment, Python, Java, and Processing and by supporting Raspberry Pi. 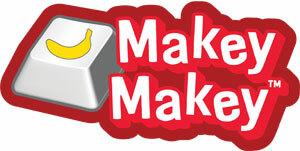 Fun and educational for primary and secondary students alike. Switch between tethered and standalone modes. Integrates with Arduino shields and many third-party electronics. 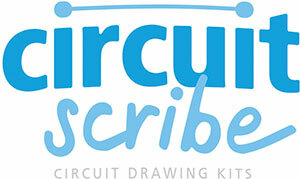 Program with the story-boarding software, Scratch, Arduino and more. 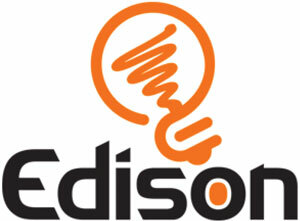 Dozens of tutorials and classroom examples available online. Arduino is built right into the controller of Hummingbird Duo, allowing the user to immediately move to that next step. 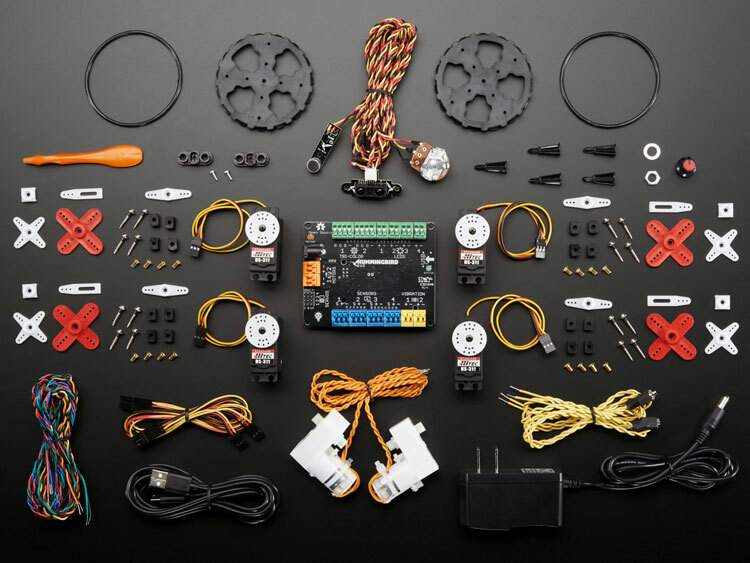 The Hummingbird Duo comes in three different sizes: The Classroom Kit is appropriate for 8 to 12 students and has parts for up to 4 simultaneous robotics projects. The Premium Kit has enough parts to build a large robot, and the Base Kit has sufficient parts for a small robot. 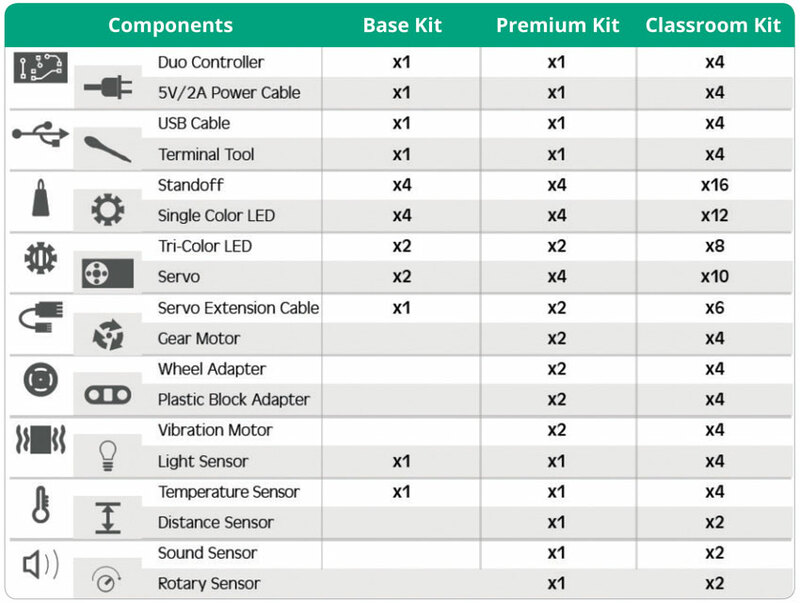 Check out the table for details on what is included in each kit. The Hummingbird Duo Base Kit contains everything you need to build a fun robot with moving parts and lots of LED lights. Sensors in the base kit allow your robot to sense light levels or temperature. 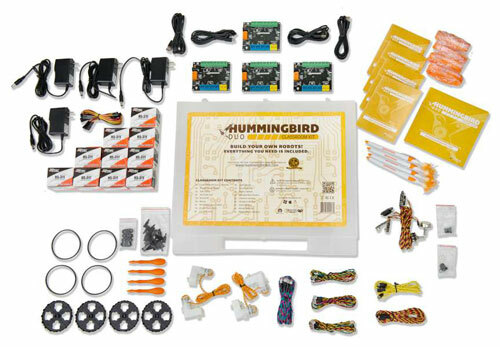 A set of 4 Hummingbird controllers and many components, this kit also includes a printed teacher guide and a copy of the book Invent-To-Learn. 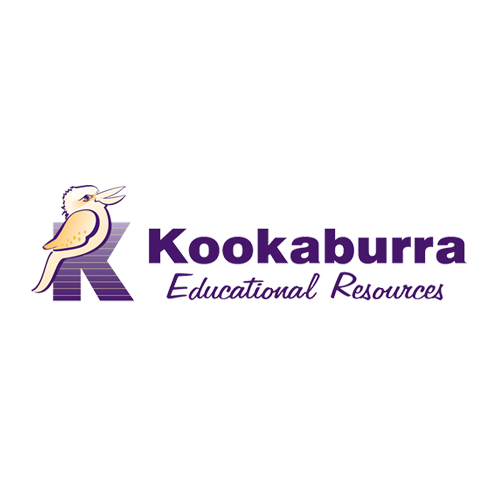 One classroom kit is sufficient for a small class or group of 8-12 students; a regular classroom will probably require two kits.